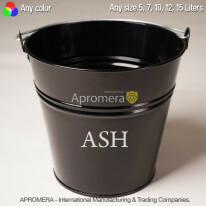 Apromera-produced Ash Bucket makes the ideal essential for furnaces and fireplaces. It also becomes a finishing touch when creating a cozy interior. Laconic design will perfectly complete the interior of a bathhouse or a garden with a fireplace or a stove in. What is more, it will last for many years due to the material it is made from. 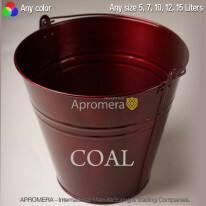 These buckets are very popular in Britain (UK) and used for cleaning fireplaces and the area around a fireplace. 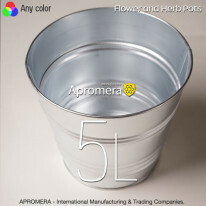 The container is made from galvanized steel of 0,45-0,50mm thickness. Whenever you burn solid fuels such as wood, coal or pellets in your furnace, fireplace or stove there is ash to be removed. It must be removed regularly, because it can affect the performance. Small burning coal particles mingled with ashes when being removed become a hidden threat. Few people know that hot coals covered with ash can remain active for several weeks/ because the latter acts as an insulator, preventing the coal from dying out. To burst into fire these “hiding” coals need oxygen. It is for this reason that firefighters often return to the fire location to pour water on the kindled coals. 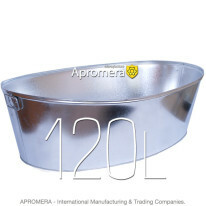 Note: Normally the substance is removed from the furnace or fireplace with a flat metal ash-storage tank or a scoop. 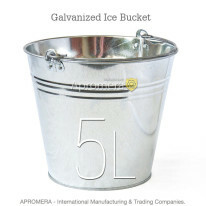 Then, as a rule, the bucket is placed in a safe location outside because it’s colder there. 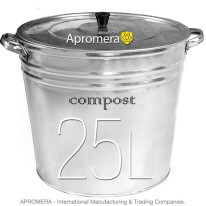 Then when you have made sure that there are no hot coals in the bucket, pour out the contents in a separate pit and cover it up with soil.